You may remember I did a trip to Islay a little while ago and wrote up some of my experiences and reviews. Well now I'm opening up some of the bottles I bought on the trip and thought I'd share what I thought about them. Hopefully I bought some good stuff and we'll see if we can get into the 90's. First up was Springbank, where I bought a bottle from their duty paid cage. We also got given a miniature of a private bottling for visitors to the distillery. So why not a little comparison? I also happen to have a small sample of one of 12 year old cask strength batches, so let's throw that in for good measure. Hey, we've got a little vertical shaping up! Let's do the miniature first. There is literally no information on the bottle, not even an ABV (although I'd guess 46%). 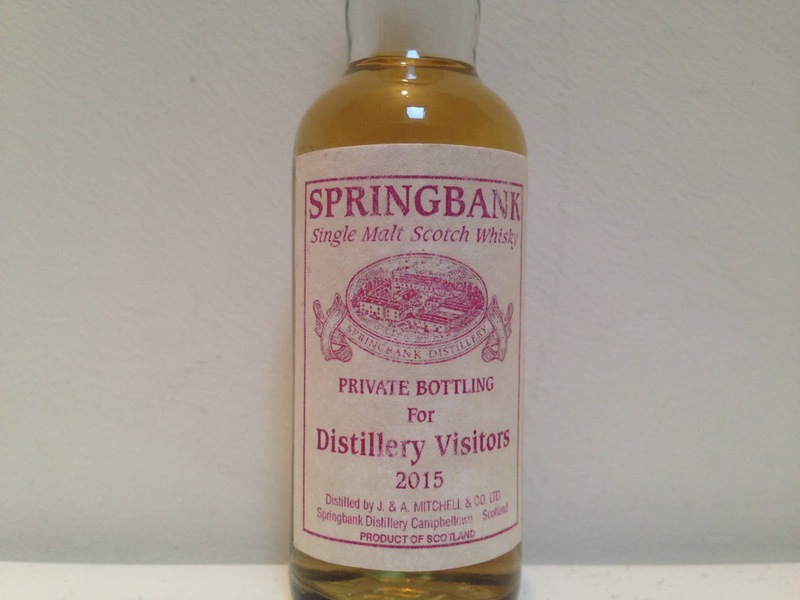 Springbank Visitors Miniature 2015 46%? Nose: Funky, light and fruity. Quite herbal and green, probably quite young. Green banana, green apple, barley, pineapple, light cinnamon, sage?, sour wood, banoffee pie. Irish whiskey style fruit. Water: More ashy and sooty with more apple and less of everything else, more focused. Toffee, fudge, banoffee pie, lemon sour. Taste: Light arrival with vanilla, some honey, building spice and fruit with pineapple, apple, banana, a little soot and ash, then more oily with salt into the finish. Water: Lighter arrival, banana, less spice, a little sour wood, more building sour and going very sour with lemon into the finish. Finish: Medium length. Salty fruit and ash. Sour lemon with water. Notes: More for collecting I think. Young and unbalanced. Well, not that great a start, but onwards and hopefully upwards. The cage at Springbank is amazing. Each bottle is taken from a randomish single cask and the rest of the cask is left to mature for longer. So each bottle is completely unique. They can also be pretty inexpensive, 10 year old or younger is £45, up to 14 was £60, 15-17 was £100ish I think and 18 year old and over was £180. Mine was a 10 year old from a Refill Bourbon Hogshead I think, label says RB HD (anyone else want to hazard a guess?). So it was actually the cheapest bottle I bought on the trip. Nose: Light and ultra clean. Lemon, lime, barley, malt, vanilla, a little alcohol, very light gin botanicals- Juniper, orange peel, lemon peel, coriander. More estery after a bit. Water: More oak, more smoke, lots more sooty ashiness. After a bit- More oily with complex citrus- Orange, lime and lemon with mango coming in. Quite zesty. Taste: Wasn't expecting this from the nose! Big, intense, huge sweet and spicy combo, mouth watering, fruity apple, pear, lots of lime juice, amazing orange, oh wow, spice, malt, barley, zesty lemon, spicy coriander, some ginger, in that order. Finishes on coriander and oak with a little sootiness. Water: Softer arrival with vanilla, really nice building development all on spicy citrus with some sootiness and oak coming through. Lovely. Finish: Long length. Oak, spice and soot. Notes: Distilled 26/11/04, bottled 10/09/15. Warehouse 7, Barrel 558 RB HD. What a find! A great whisky. If the nose was on par with the taste this would be in the 90 range. It's actually very clean for a Springbank, not much dirty funk. Let's compare with the cask strength OB for the hell of it. Nose: Much more full and sherried. Funky sweet sulphur, sherry, malty and nutty, a little herbal, heather smoke. A lot more smoke with dirty sootiness galore. Water: More heathery smoke, some saltiness coming up, a little raisin, more oily. Taste: Lovely. Perfect oily malty delivery, building smokiness, sooty, spicy, malty. Oak, aniseed and soot into the finish. Water: Heathery smoke, much more spiciness, much more oak. Still really good but a tad unbalanced now. Finish: Long length. Oak and ashy soot with some aniseed/liquorice. Notes: Better without water. Better than the other batch I've had which was 53.2%. 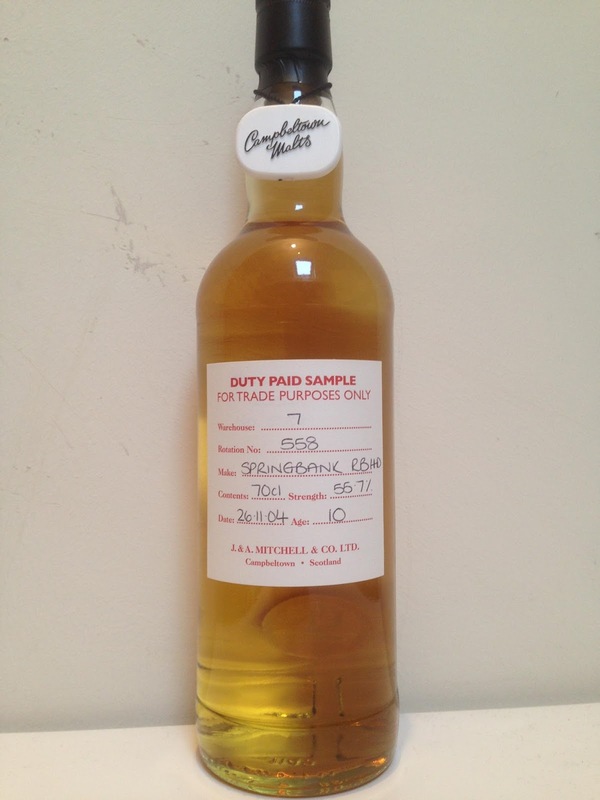 A lot more funk, a lot more dirty, more classic Springbank style I'd say. Conclusions: Springbank is generally pretty epic. If you're in the Cadenheads shop in Campbeltown, definitely get a bottle from their duty paid cage. They may also have Hazelburn, Longrow or Kilkerran in it. Really unique stuff.